We have a pet. 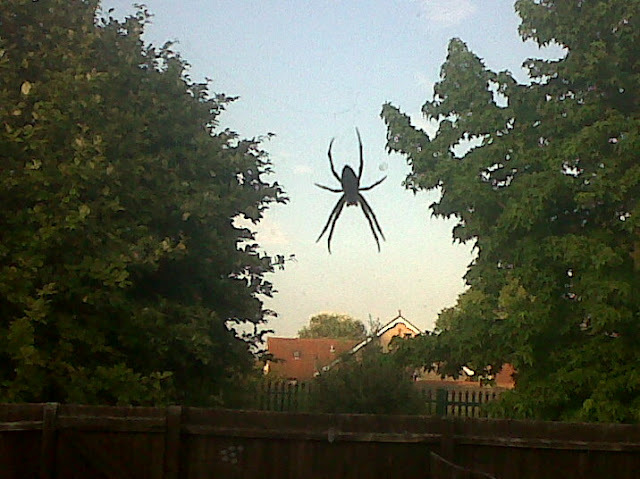 She lives on the outside of the kitchen window on a huge web. She has lived there for about 4 months. We have to look for her every morning before breakfast, because she hides under the lip of the window sill. She scares the shi*t out of me. As a frame of reference, here she was back in September. Look how skinny she was. Look how chubby huge she is now. And even though she's been our pet for 4 months now, if she ever comes through the window, I am not kidding, I will kill her immediately. Before she starts eating me and my family.